Before we start, I highly suggest taking a look at our initial tips post for the PS4—it covers some of the larger, more well-known features the PS4 has to offer. This post will be for the more obscure, but still useful things you can do with the PS4. 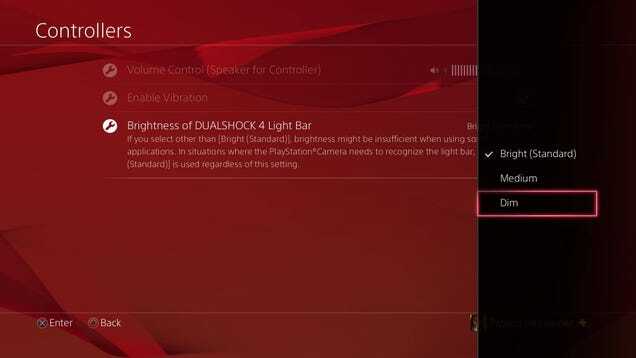 While you can’t turn the lightbar on your PS4 controller off, you can at the very least make it less bright. All you have to do is go into Settings > Devices > Controllers, and pick your desired setting. Alternatively, you can do what Kirk did, and straight-up cover the thing with a piece of tape. Whatever works best for you! Worth noting that if you do cover up the light bar, you won’t have a way of telling which controller belongs to which player. Pro-tip: blue lightbar is player one, red is player two, green is player three, and pink is player four. The more you know, eh? You can swap between your two most recent apps or games by double-tapping the PlayStation button. Note that this doesn’t work for every single app or game, but for those that it does, it’s a quick and easy way to move between apps. 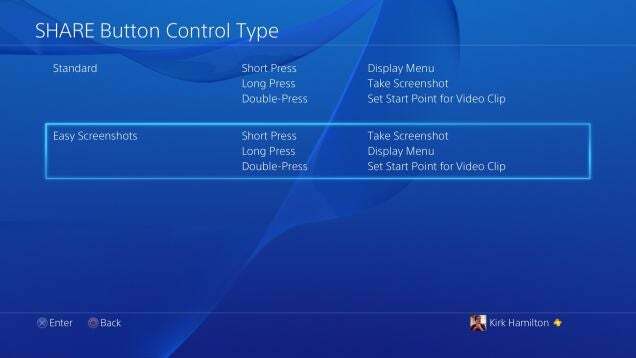 Stephen Totilo writes: On PS4, highlight a game and press options. If the game has ever been patched, there will be a menu option on the right called “Update history”. If you select it, you’ll see the game’s patch notes. 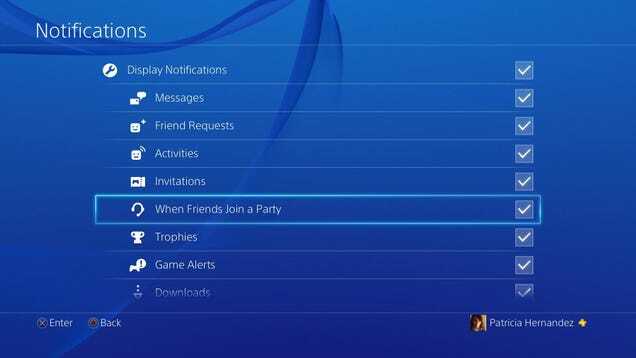 For whatever reason, the PS4 is automatically set up so that it sends you a message whenever one of your friends enters a party. I don’t know about you, but I don’t consider that a useful piece of information, and more often than not having that message pop up on my screen during game time is an annoyance. But if you go into Settings > Notifications, you can simply uncheck the “When friends join a party” box, so you never have to deal with it again. You can, of course, adjust the rest of your notifications to your liking. If you have a nice microphone lying around, why not use it on your PS4? Provided it’s a USB microphone, you should have no problem using it in your favourite games—so don’t feel like you absolutely have to shell out for a PS4-branded mic. I personally use my Yeti mic for streaming on the PS4. Hell, I’ve gotten reports that people use old PS3 and PS2 (!) headsets/headphones with the PS4. Additionally, you can also use a keyboard or mouse on your PS4, if you’d like. The uses are somewhat limited, but still, the option to plug in these devices is there. If you do, you can hop into Settings > Devices to tinker with your options. If you play a lot of online games, you’ll note that sometimes, people might feel like sending you unpleasant messages. But, they won’t be able to do that if you change your settings. 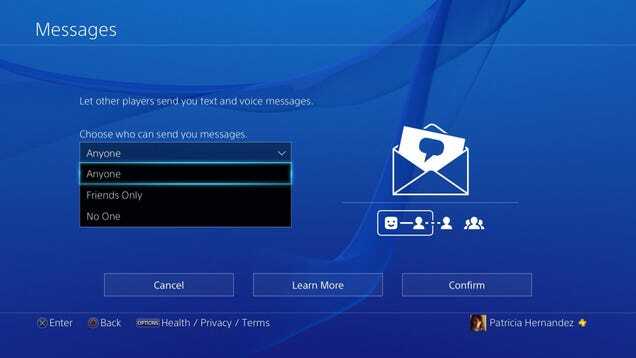 If you go into Messages, push the “Options” button on your PS4. You’ll see “Privacy Settings” pop up. Select that, and tweak your settings as desired. If you’re a particularly private person, you can even adjust what your friends can see on your profile by going to your Profile > Privacy Settings and adjusting as you see fit. You could make it so people can’t see your recent activities, or you can hide the trophy information for whatever games you’d like. 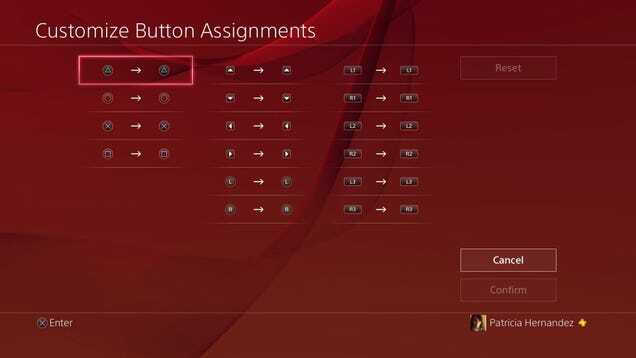 One of the newest features the PS4 has to offer is a great one: button remapping. All you have to do is go into Settings > Accessibility > Button Assignments, and voila. You can now dictate how you’ll play your games. Instead of going into the Share menu every time you want to take a screenshot or video, you can adjust your settings so all you have to do is press the button a certain way, as Kirk details here. First, you’ll want hit the Share button. Then press your Options button on your PS4 controller, and select “Share Settings.” From here, you’ll be able to tell your PS4 how to handle Share button presses. You can, for example, make it so a short Share button press quickly takes a screenshot, instead of taking you to the Share menu. Up to you! Thanks to the share button, taking screenshots of all your rad moments is very easy. That’s kind of the problem: if you’re regularly taking screenshots, how do you prevent things from getting out of hand? It’s not like your Twitter followers want to see every orc you killed in Shadow of Mordor or whatever. Kirk detailed a workaround in his post here, but personally what I find works best for me is to upload to Facebook. However, I change “Facebook Audience” to “Only Me.” That way, I can upload everything I want without anyone else being bothered—I’m the only person that can see it! Hopefully in the future there’s an option to upload to image hosting services instead, but for now, solutions like these will have to do. If you have multiple accounts on your PS4, but you happen to use the system the most, it might be worth setting your account to automatically log in. To do this, go into Settings > Users > Login Settings and check the appropriate box. 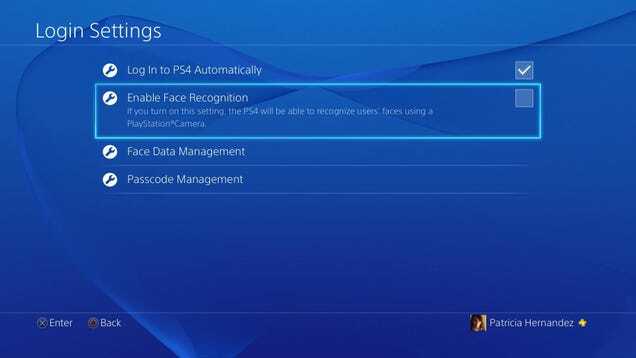 If you happen to have a PlayStation Camera, you can also make the PS4 pull a Kinect and have it automatically sign you in via Face Recognition. Futuristic, eh? This tip isn’t exactly useful, but some of you will get a kick out of it. If you go to Settings > System > System Information, the PS4 actually lets you give the device a name. I went with ‘Hirai,’ but only because it would make for a silly screenshot. You can probably be more creative! If you have any special tips or tricks that you think would be useful for PS4 owners to know, do make sure to leave a comment!